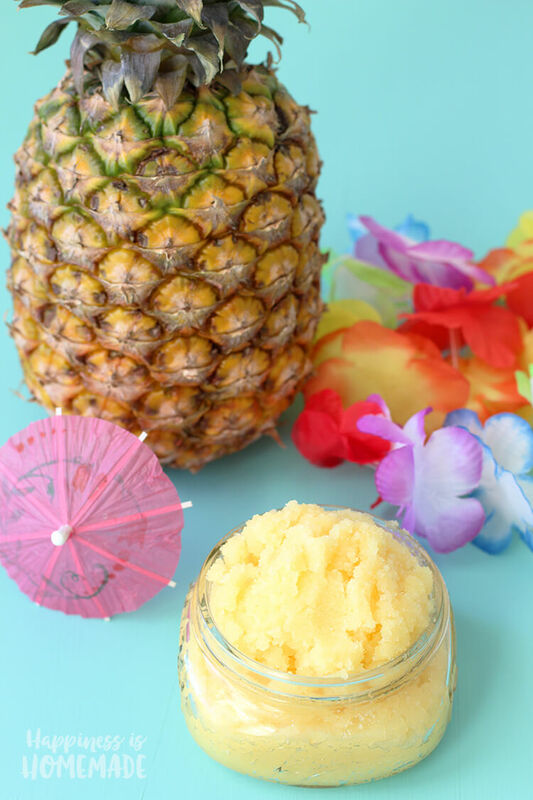 Pineapple + coconut are a deliciously tropical combination, and these DIY Piña Colada Sugar Scrub and Mini Soaps are the perfect way to keep your summer skin refreshed and ready to show off! 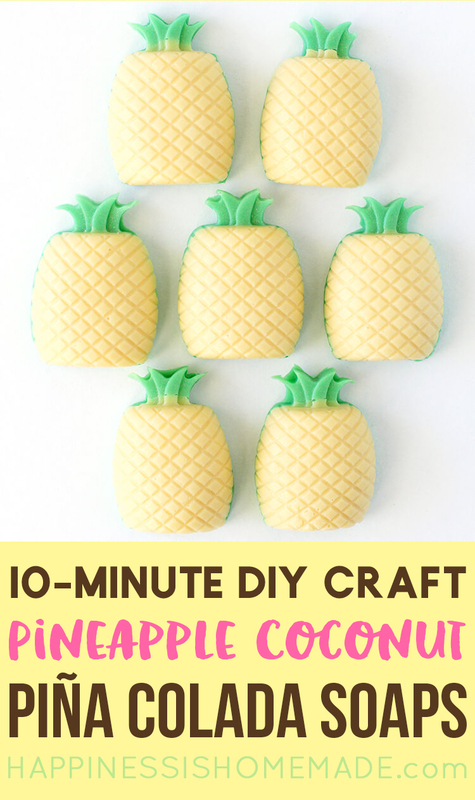 This quick & easy craft takes less than 10 minutes to make! 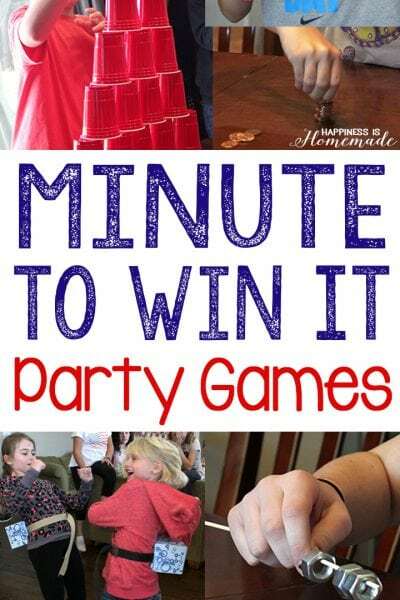 You can totally do this! Y’all know how much I love my sugar scrubs, especially during summer when the weather is hot, and I’m showing a bit more healthy skin than the rest of the year. 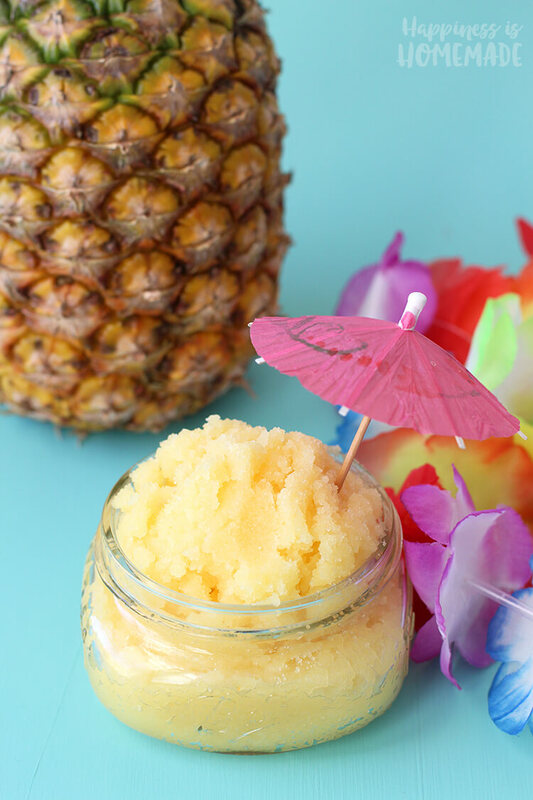 This homemade piña colada sugar scrub is great for sloughing off old dead dry skin, leaving you feeling clean, silky smooth, and ready to take on the world! Plus, you’ll smell AMAZING! Start by coloring your sugar, if desired. It only takes a TINY bit of food coloring! Remember, once you add the coconut oil, the color will appear darker and more saturated than the sugar does. For this batch, I added three drops of food coloring to one cup of sugar, and stirred until they were completely combined. 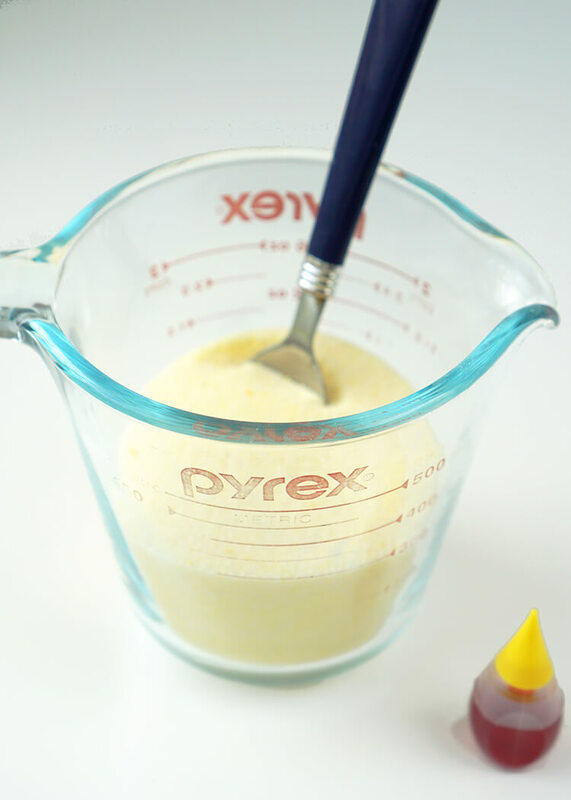 Stir the coconut oil and the pineapple fragrance into the sugar, and your scrub is ready to use – easy peasy! 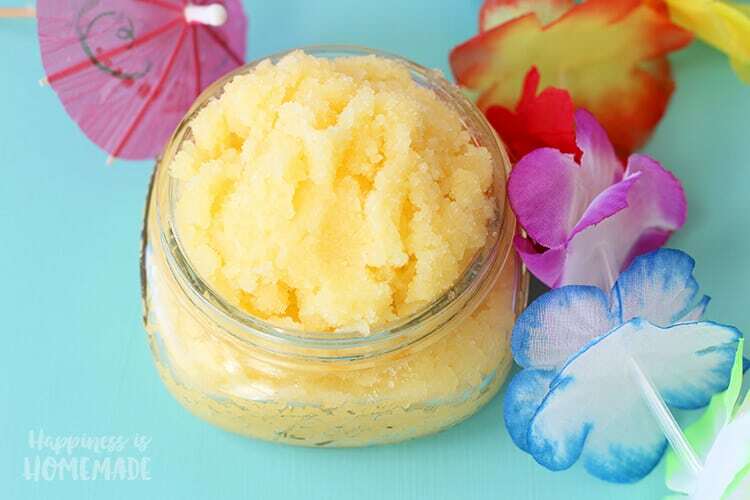 Feel free to add a bit more sugar or coconut oil if you prefer a drier or runnier consistency to your scrub. Note: if your coconut oil is solid (at temperatures below 76 degrees), you can warm it in the microwave until it becomes a liquid for easier mixing! 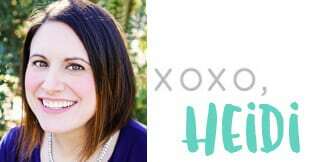 This sugar scrub is sure to be your newest favorite beauty product, and it makes a fantastic (and inexpensive!) homemade gift idea as well! 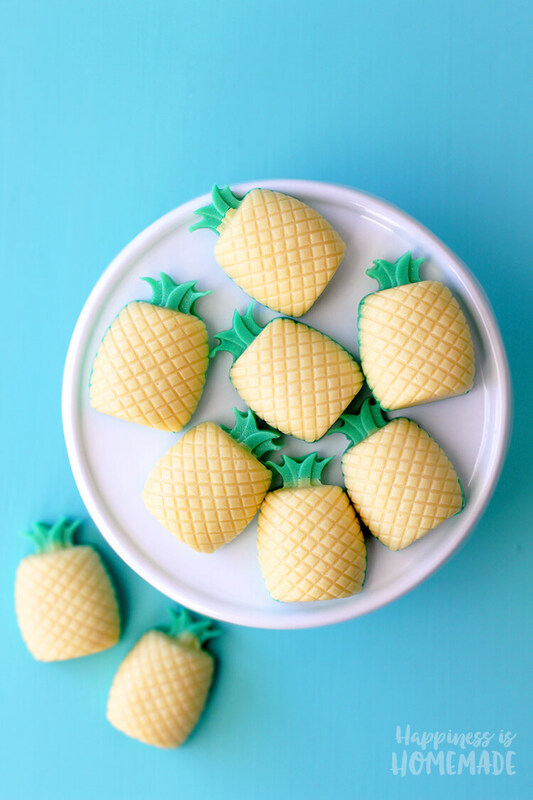 While I had the pineapple fragrance oil out, I also whipped up a quick batch of these adorable mini pineapple soaps. 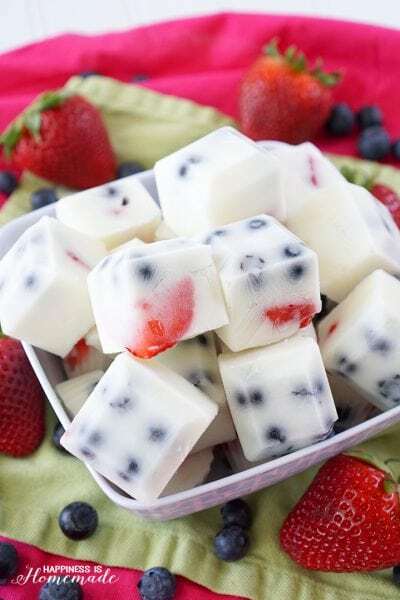 They also make a great gift and take just a few minutes and a couple of ingredients to make! For more in-depth detailed instructions on how to make melt & pour soaps, check out our DIY Pumpkin Spice Soap post! Have you ever done some soaps with the loaf bar? Hi! 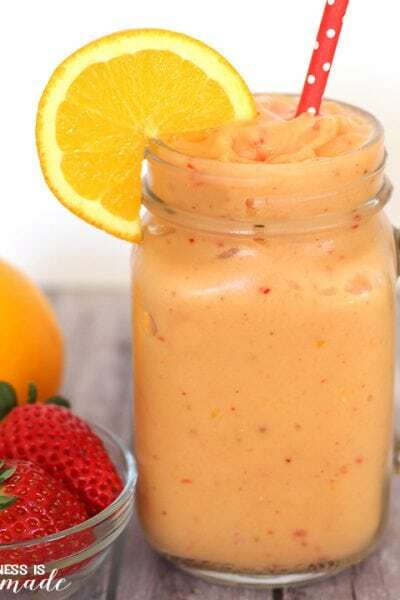 I’d like to enter the world of home made scrubs, but I need to know if there’s a specific type of container, or a simple mason jar will do? How long does it last? 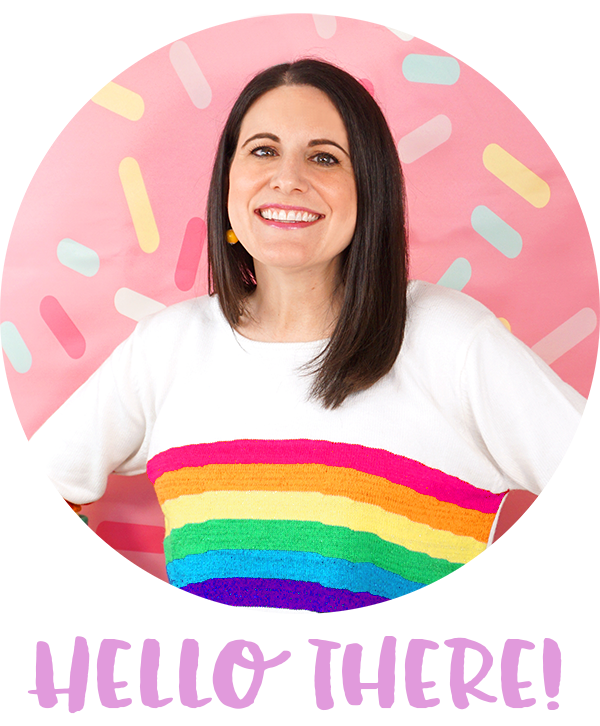 How much sugar scrub does this recipe make? It makes around 12 oz of scrub. How much pineapple fragrance did you add? Thanks! I added around 10 drops, but you should be able to discern from smell how much you prefer to add. For the scrub, is it coconut nut oil solid or liquid, when you buy it? Do you know how long this will last? I would like to make this as part of the favors for my best friends baby shower which will be in June and I will need to make a ton haha! Just wondering how far in advance you think I could start to make it and it would still be ok by the shower? Thank you! Hi ! 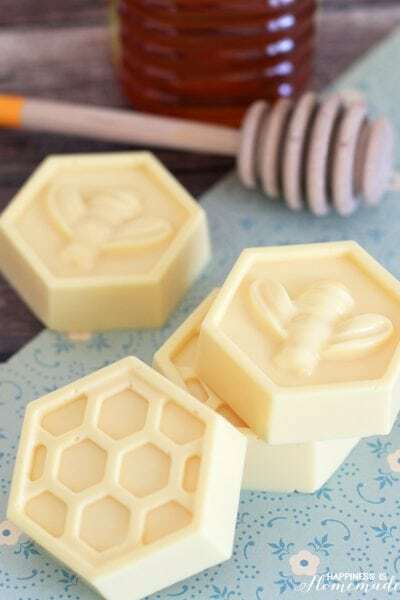 Love your scrub and soaps! Super cute! can you guide me on where to find the jars? How many ounces are the ones pictures? Thank you! Hey. I love your Pineapple Scrub. I just wanted to know what size container will the Scrub fit in? Please reply! Thanks! 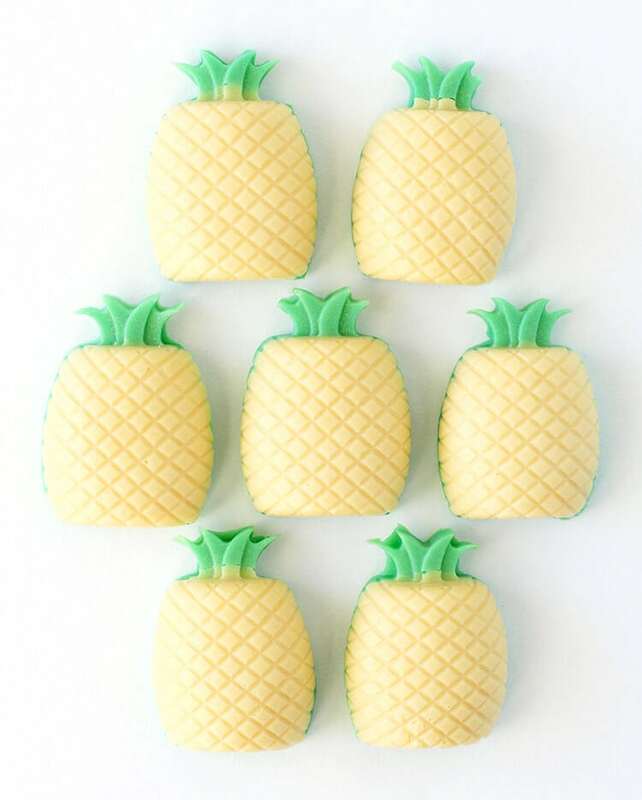 Do you ever play around with scents for the scrub, or do you always stick with pineapple? I’m just not sure what else I’d use it for. 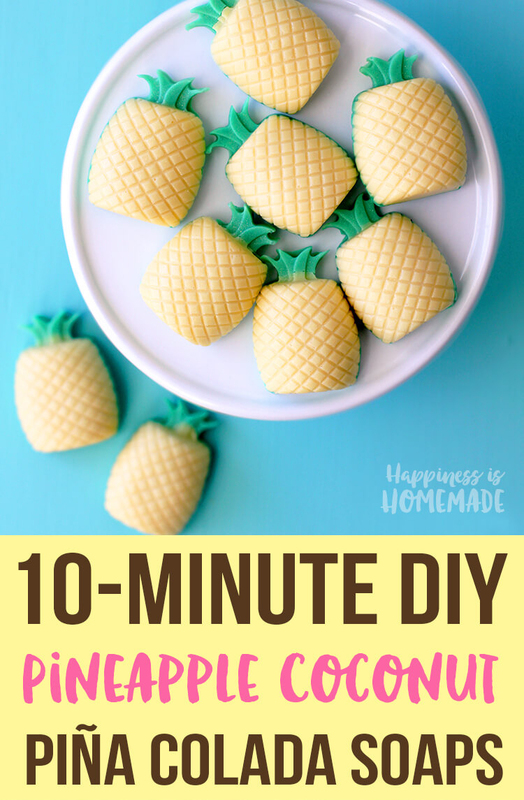 These are some really great DIY sugar scrubs and I am going to try the pinapple one.I bet it smells amazing. Is this able to be used on lips. If I needed to make 16 jars of this (for gifts) how many times would I need to duplicate the recipe? 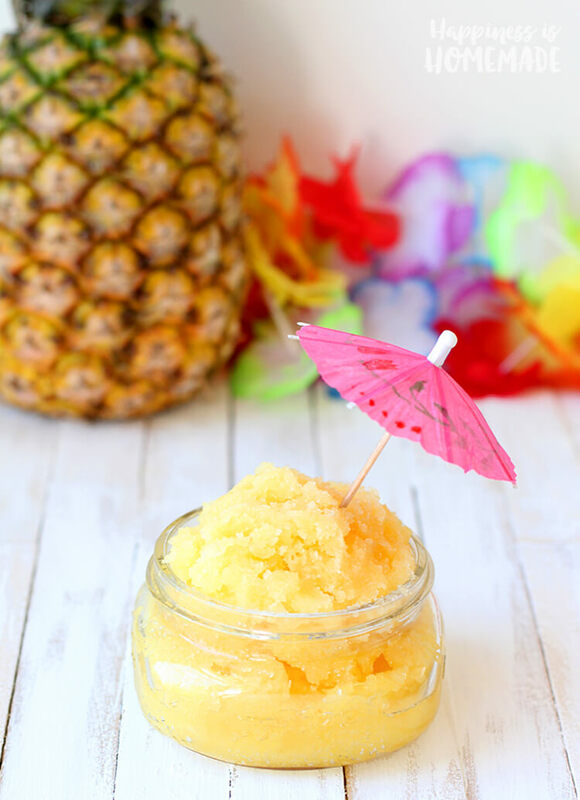 Is it possible to use pineapple juice instead of pineapple fragrance oil for the Piña Colada sugar scrub? Thanks!